It takes a very clever writer and director to take a topic that is so negative and so emotional such as suicide, group suicide no less, and turn it into a comedy sketch that still has heart and meaning. Fortunately in this case, that’s exactly what happened. 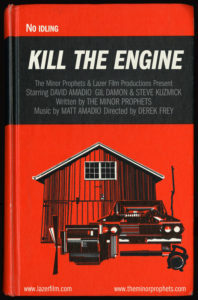 The film begins with three guys trying to start a car and through the conversation and sub textual inferences we make, it becomes clear they are trying to gas themselves. From the off the three main characters have a great rapour which helps the audience connect with them. They aren’t your typical suicidal characters which makes them more human, they have identity. The fact that they can’t get the car to start is what brings in the humour but it is subtle and done well. The overlaying joke is the fact they are trying to breath life into a car (literally at one point) that is eventually meant to kill them. It’s that sort of ironic dark humour that works really well here. The script is clever, both in its subtle use of dialogue which isn’t over used or too exposition all, and in the structure of the narrative. It’s simple yet clever and effective. The audience are given just enough to get in on the jokes, and just enough physical comedy that it doesn’t turn slapstick. The ending works particularly well. This suicide attempt has actually brought these guys together and the fact that they accomplish their goal leaves them elated, until they realise what it ultimately means. The end. But we never see what they choose to do. The hose pipe in the care window offers a suggestion but it isn’t conclusive, and it’s that that leaves the audience questioning and talking. That is what effective film does, it stays with the audience. An excellently constructed short film that utilises it’s dark comedy perfectly. With strong performances and a well written script, this is definitely one to watch.